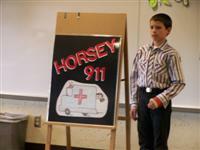 A 4-H Public Presentation can be a demonstration or an illustrated talk. It should teach a skill, concept, or principle. At area and county contests your public presentation must be related to a project you are enrolled in. Public Presentations should be a minimum of 3 minutes and a maximum of 20 minutes. Recommended time for Juniors is 3-8 minutes, Intermediates is 5-15 minutes and Seniors is 8-20 minutes. Maximum length includes set-up and clean-up. You may request permission to use live animals at the county level. However, live animals are not allowed at State and your presentation will need to be adapted. You are encouraged to use life-like models, miniature models, and/or illustrative materials where practical to visualize your presentation. Visuals should enhance the understanding of your presentation, be legible, and easily seen. Blue ribbon winners at area contests may advance to county finals. Junior, Intermediate, and Senior blue ribbon winners at the county contest will advance to the State 4-H Fair competition. Check out “Blueprint for Success” prepared by Public Presentation Program Leader Linda McCanna. This is valuable information to help you present in the proper format. You can contact Linda McCanna at 935.8942 for more information. She can also visit your club and teach you how to prepare and deliver a blue ribbon presentation.